This is turning out to be a quiet weekend. I slept in this morning and then did housekeeping chores. It is cool and overcast today, and tomorrow it's supposed to rain. Nice stay-home-and-cuddle weather. Charlie turned four years old earlier week. We celebrated with treats and toys. When he got in the laundry basket this morning, I picked it up with him inside and swung it around like he was on a carnival ride. Charlie liked it so much we did it a few more times. He is just the funniest, sweetest cat I've ever met. I visited the wetlands close to my office on my lunch hour this week. I'm very interested in getting a new digital camera and learning how to photograph wildlife. I love my current camera, but can't seem to get the shots I want (which may be more my fault than the camera's). 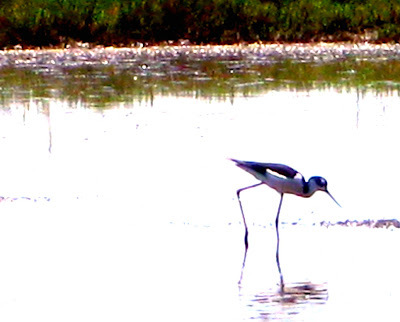 Since the photos I took at the wetlands came out rather boring, I played around with Picnik to make them more interesting. 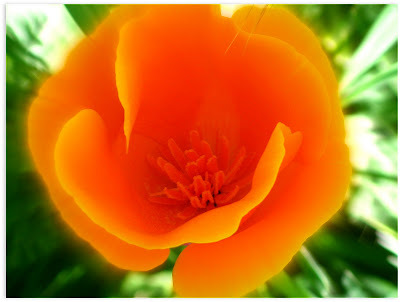 The California poppies are in bloom everywhere. It is our state flower and they are so lovely to photograph. I watched all five hours of Pride & Prejudice last night and enjoyed it very much. I'm hoping to start a new and interesting knitting project this evening, but I'm not sure what it will be. How are you spending your weekend? OH my! If I swung Harold around in a laundry basket he would probably implode- he's such a little scardy cat he can barely tolerate being picked up! Also, I love the photos! Also, five hours of Pride and Prejudice sounds like a great time! Well Happy Birthday you handsome Charlie! What a sweet cat and I bet he really enjoyed his carnival ride:) Beautiful pictures, and creative changes in Picnik. I really need to know how to do different things with my camera but tend to just point and shoot. Have a blessed day my friend, Hugs from Georgia! There is no award for paying in change, even for correct change. Happy Birthday sweet Charlie! What a cutie. Fun photos. I love the colours. I'm not that great with a camera - like you, I don't blame the camera. I know it's all me. Nice to have a quiet at home weekend. Those are the best especially when it is raining. Love what you did with those pictures. I just finished making a paper journal. No class. It is really fun. I will be posting it soon. I can help you make one. Charlie is a funny cat. Happy weekend - happy you are having a good one! 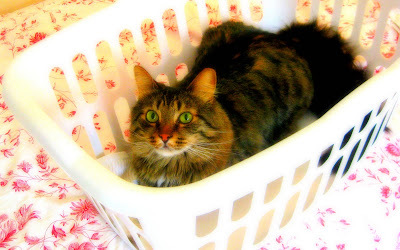 I can't imagine swinging my cats around in a laundry basket - I think they'd cut me to bits! Stop by my blog - I have something for you! Beeeeautiful pictures Ms. Golden Bird. Happy Birthday to your cute kitty - he looks just sweet as can be!